I recently read the new book being released this week by New Growth Press entitled, God Made All of Me. It is a children’s book—or more accurately, a book for parents and guardians to read to children—by Justin and Lindsey Holcomb. The Holcombs are authors of the important and helpful book, Rid of My Disgrace: Hope and Healing for Victims of Sexual Assault. Whereas that book is curative this new one is designed to be preventative. God Made All of Me is a sadly necessary but hopeful and helpful book. The prevalence of childhood sexual abuse is staggering. There have been seasons in my pastoral ministry when dealing with the brokenness that results from this crime has almost been overwhelming and left me wondering if anyone in our culture has escaped the devastating wounds inflicted by it. Statistics suggest that 1 in 3 girls and 1 in 7 boys will be sexually assaulted during childhood. The Holcombs have written this book to help parents and other adults work to diminish such assaults. The book is written in a sensitive, direct way. 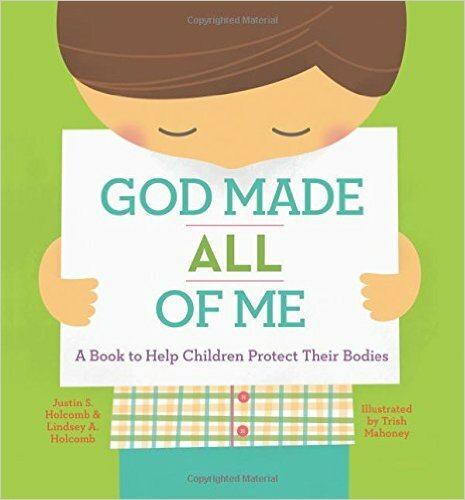 Using Scripture and catechetical instruction that are colorfully illustrated, children are helped to understand that God made their bodies and declared them, as well as all creation, to be good. Children are taught to recognize and say no to inappropriate touches and conduct and to distinguish between that and appropriate touch and conduct. As I read the book I experienced profound sadness and gratitude simultaneously. It is sobering to face the fact that such a book is needed—desperately needed—in our day. But I am deeply grateful that the Holcombs and New Growth Press have addressed that need in such a thoughtful, sensitive way. I highly recommend the book to parents, grandparents, aunts, uncles and all other adults who have children in their lives. May the Lord use it to help spare many the horrible abuse that comes from sexual assault.